... 1872 (140 years ago today), Julia Morgan (left) was born in San Francisco, California. After earning a degree in civil engineering in 1894 from the University of California, Berkeley, she moved to Paris, France. There, after 2 years of failed attempts -- failures she attributed to a bar against women -- Morgan became the 1st woman admitted into the Ecole des Beaux-Arts and then the 1st woman to receive an architecture degree from that noted school. Returning to California, Morgan won renown as an architect of several structures on the Berkeley campus, of numerous YWCAs, of the Hearst-owned Los Angeles Examiner building, and of the lavish Hearst Castle situated on the California coast. 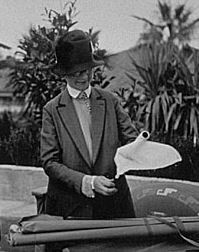 (photo credit) She died in 1957; in 2008, she was inducted into the California Hall of Fame.